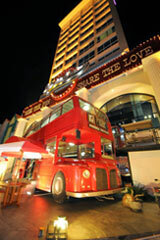 Jakarta, June 11th 2014 – In cooperation with Double Decker Restaurant, favehotel Solo Baru has launched its new casual dining restaurant that merges 1950s America with the iconic double-decker buses found in London. The new restaurant is the first Double Decker Restaurant branch in South East Asia, bringing with it a concept that reinterprets casual dining in the 50's. Located on the lower ground floor of favehotel Solo Baru, the idea was to create a warm, fun and cozy joint that serves quality meals in a friendly environment, suitable for young families and their kids. The restaurant consists of 3 stories, with the 1st floor representing the fun, famous atmosphere of New York's Times Square. The 2nd floor is then designed in a 1950s suburban style, where guests can enjoy the reinterpretation of London's Double Decker bus experience. 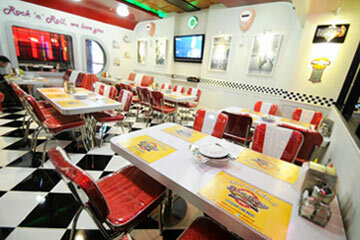 Then finally, the 3rd floor showcases a theme of a 1950s American-style diner. The restaurant's menu offers a variety of cuisines, from American-style burgers, steaks and milkshakes, to Asian delicacies and other global signatures. There is also a number of delicious desserts on offer for afters. The favehotel Solo Baru has been designed from a guest’s perspective and is ideal for business travelers, leisure tourists and families. It is strategically located on Jalan Ir. Soekarno in the immediate vicinity of Solo Baru’s popular Pandawa Waterworld, approximately 20 minutes from downtown Solo. The 153 fun, fresh and friendly rooms, each one quiet and soundproofed, feature comfy double or twin beds with fluffy duvets, pillows and 100% cotton sheets. These economical rooms are all equipped with LCD TV’s, individual air conditioners, en-suite bathrooms with standing showers as well as free Wi-Fi connections throughout. 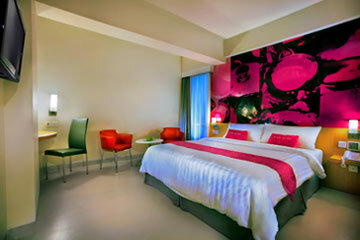 Each room also has an easy-to-use security key card locking system for extra safety and peace of mind. favehotels currently operates 27 hotels throughout Indonesia and Malaysia out of which 10 are in Jakarta and 4 in Bali and has a development pipeline of more than 40 hotels in Indonesia, Malaysia and the Philippines.